On the eve of Zimbabwe’s first elections without him, former president Robert Mugabe sprung a surprise press conference declaring he’d not vote Zanu-PF. On the other side, opposition MDC leader Nelson Chamisa welcomed any votes with open arms. There’s nothing clearcut about Monday’s poll. Campaigning in the Zimbabwean elections had stopped on Sunday, but far from waking up to a rest day, journalists were summoned at the last minute to an 11:00 press conference by former president Robert Mugabe. He addressed hordes of media from an Eastern-style pagoda near a small lake in the ample grounds of his retirement residence in Harare’s posh Borrowdale suburb. It’s dubbed Blue Roof, for obvious reasons. “I have said it before and I have said it very clearly. I cannot vote for those who have tormented me. I can’t. I will make my choice among the other 22,” he said, with reference to the presidential candidates, of which President Emmerson Mnangagwa is one. After 38 years it was painful not being on the ballot, Mugabe said, but “that is the reality”. The press conference was punctuated by the sound of the snapping legs of plastic chairs on which journalists climbed, trying to see and hear the 94-year-old, who kept slumping in his chair and who had to be propped up on the cushions every so often by his aides. Five years ago there was a similar last-minute elections press conference, and a similar scramble by journalists to hear, but that one happened from the powerful veranda of State House with its kitsch mix of colonial and African décor, and it was full of assurances that the poll would be fair. On Sunday Mugabe didn’t outright say he’d support MDC leader Nelson Chamisa for president, but he hinted that, out of all the candidates, he was most impressed by Chamisa’s campaign. “He seems to be doing well, going by his rallies,” Mugabe said. In a country where the size of one’s rally almost trumps the elections outcome, that says a lot. There’s been chatter on social media about people leaving Zanu-PF rallies while Mnangagwa was still speaking, something unheard of under Mugabe. Mugabe’s last-minute press conference upset Chamisa’s pre-planned event on Sunday, partly because it went on so long. Chamisa’s press conference was scheduled for 12:30, which could have worked had it not taken an hour to get the huge media contingent through security and into Blue Roof’s grounds, and had he not gone on for a painful two hours. Chamisa denied reports in the Zimbabwean media that he was politically and financially supported by Mugabe, and that he had agreed to make former first lady Grace Mugabe his vice-president. He was happy, however, to accept Mugabe’s vote. “Even if you tell me you support me and you are on the voters’ roll, I will welcome you, because I need every vote at this particular moment. This is a crucial election, this is a do-or-die. It’s no longer about Mr Mugabe, he is not on the ballot, it’s about this candidate,” Chamisa said, referring to himself. No room for the fake humility of former liberation party leaders here. Mugabe, in turn, denied having met Chamisa, but said he’d love to do so should the 40-year-old win. 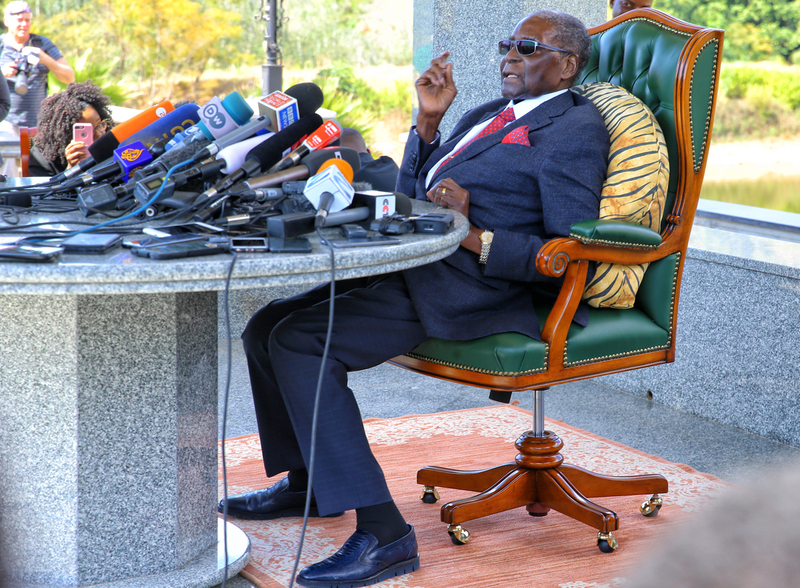 Mugabe’s press conference at times descended into the absurd. If you didn’t know he ruled through the gun and was accused of condoning abuses and violence, you could easily mistake him for a democrat. There’s nothing as humbling, or democratising, as a loss of power. Although none of the regional leaders would say this out loud, Mugabe’s calling the November coup d’etat by its name was one of the times that he did manage to touch on reality. He said the people’s voices should be first. “These are the beings that we always strive for,” he added. There were also times that he sounded like a bored pensioner, concerned about money and the sagging roof of his Yugoslav-built house. He seemed to imply that he told the Yugoslavs to build it in the Chinese style, but because they hadn’t done so, the roof was now sagging and would be gone in two years. He’d get the Chinese to help him fix it, if only he could afford to do it. There’s also the speculation about some alleged $10-million he got in pension money, but he said he had gotten none. That’s probably a little bit more than most Zimbabweans are getting. In their lifetime. Mugabe also believes his family was being demonised and haunted, and from the way he was speaking, he is a virtual prisoner inside the Blue Roof estate. When asked what he referred to, he accused the Zimbabwe Herald of demonising his wife. “I don’t accept the denunciations that is going on of my wife every day. Perhaps they thought by attacking her, they are attacking me, those who write in The Herald especially. I want my Grace to remain my Grace,” he muttered. He denied ever pushing her to become president, which was the issue that had finally turned some party members against him. From the way Grace sat a few metres away from him on the side of the pagoda, sheltering from the sun under a large umbrella that celebrates the 25th anniversary of Zimbabwe’s democracy, it was clear that she is in fact the one in charge. She passed him a note at one stage, and prompted him to speak up when he started muttering. The press conference and question-and-answer session came to an end when she gave the signal. Bodyguards had a tough time ushering journalists away, because all wanted to ask a last exclusive question, armed with cellphone video cameras, and when they finally retreated, the wife posed with her husband for pictures and photographers came running back. Mugabe remained seated as journalists were ushered away, but needed considerable help to get into the car that would drive him the few metres back to his house. Mnangagwa capitalised on this apparent partnership between Mugabe and Chamisa to assert his authority in Zanu-PF, but perhaps also as a warning to any elements in the army that might be disloyal.